Greenavi Cafe, and Wild Thing Panini | Mmm, Tasty! I know, I know, I’m a sucker for cafes. I drink quite a bit of coffee, what can I say? Before I get to a quick review of Greenavi on Queen West, I’ll do a quick followup about Wild Thing. Remember that post I made a few months ago, mentioning their delicious looking panini and promising to go back and try one? Well, I finally did last weekend, and the results of that are pictured to your right. 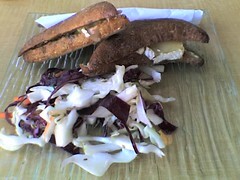 I ordered the Brie, Garlic and Apple panini, which came with a fennel slaw. The panini was delicious: simple cibatta bread spread with what tasted like garlic butter and filled with thick slices of brie and thin slices of apple, served hot from their panini grill. The slaw was also really tasty. I love fennel so it really worked for me. Two thumbs up, and reasonably priced at around 7 bucks. Now, on to Greenavi, which opened at the beginning of the summer in the space vacated by Just Us. The owners at Greenavi seemed to want to continue on where Just Us left off, offering organic beverages and food. The space hasn’t been renovated much since the new owners took over. Sure, all the Just Us stuff is gone, but it basically looks the same as it always did, only with a different menu board. This isn’t a bad thing, really, it’s more an observation. Clearly, the previous owner wanted to sell everything and get out of dodge as quickly as possible. A quick glance at their product wall and display case tells me that they get their espresso from 49th parallel, other coffee roasted locally, chocolate from Coco Camino, and many of their baked goods come from the same vegan bakery that supplies The Big Carrot. Not bad! 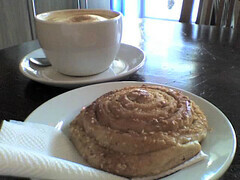 On my first visit, I decided to get a large latte and a coconut and sesame sticky bun, which I’d had before at The Big Carrot. I eyed their menu of wraps and panini, but decided I was in the mood for something sweet. The latte was a bit too milky for my tastes, but then, what do you expect when you order a large? 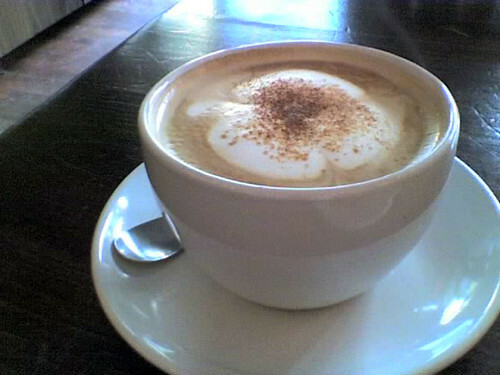 Next time if I want a big coffee, I’ll go for a cappuccino, or maybe just an americano. That said, what I could taste of the espresso in the drink was nice, and it was a good-sized cup for the price. On a second trip a few days ago, Rich and I discovered that they use 100% compostable/biodegradable takeout cups, which I’m a big fan of. Yes, takeout cups still generate waste, but it’s far better than the styrofoam cup variety. Another bonus: They’ve got free wifi. I’ll admit that makes it a bit frustrating to get a table on the weekends, with students settling in to write papers or study, macbook plugs snaking around the tables to the nearest plug. But hey, it’s a niche that needs to be filled. I think I may just join the students some afternoon soon and do some marketing work for my own job. Beats sitting on my sofa at home.